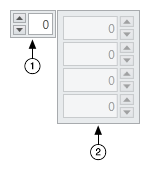 The following image is an example of a one-dimensional numeric array control. Index display—Determines which element to display at the top of the array control. An array index is zero-based. Element display—Value in the array.